Many people feel that low-income neighborhoods have less access to supermarkets than other neighborhoods do. In contrast with the conventional wisdom, the results show that high poverty block groups had closer proximity to the nearest supermarket than other block groups did, on average: 85.6% of high-poverty block groups had a supermarket within 1 mile, while 76.8% of lower-poverty block groups had a supermarket within this distance. This finding makes sense when you consider the average population density of poor neighborhoods. Low-income neighborhoods may be urban or rural, but on average they are more likely than other neighborhoods to be urban and population-dense. Supermarkets tend to locate reasonably close to where people live. Population density is a strong predictor of proximity to the nearest supermarket. Block groups with very high population density generally had very close proximity to a nearest supermarket. In block groups lacking a nearby supermarket, rates of automobile access generally were quite high (more than 95%), although this still leaves almost 5% of the population in these areas lacking both an automobile and a nearby supermarket. Other recent research on the food retail environment similarly emphasizes the importance of automobile access. For example, see a fascinating report by Mabli and Ohls (.pdf) on the website of USDA's Food and Nutrition Service. It is worthwhile to compare these findings to other influential literature on lack of access to supermarkets. The online tool from the Reinvestment Fund identifies areas with Limited Supermarket Access (LSAs). The detailed report (.pdf) from the Reinvestment Fund agrees with our findings in several respects. For example, Table 2 in the TRF report confirms that low-population-density neighborhoods tend to have high average rates of automobile access (above 95%). Table 3 in the TRF report shows that neighborhoods with higher population density and lower average rates of automobile access typically have very short median distances (much less than a mile) to the nearest supermarket. The Reinvestment Fund classifies a particular neighborhood as having Limited Supermarket Access if the nearest supermarket is farther than a threshold distance based on non-poor neighborhoods with similar automobile access and population density. In urban areas, the threshold distance may be four fifths of a mile away, and in some cases merely a third of a mile away. Because supermarkets are an automobile-oriented retail format, I have some misgivings about defining limited access using such short threshold distances, even for low-income populations. But I am eager to hear the views of others on that question. The implied remedy in any method for identifying areas without supermarkets is to invite or persuade a supermarket to locate in a particular location. The new supermarket outlet will have to compete with other stores that customers at all income levels may prefer. The new store will not have a captive market. Of course, if communities put great effort into attracting a supermarket, we hope it will succeed and thrive once it gets there! 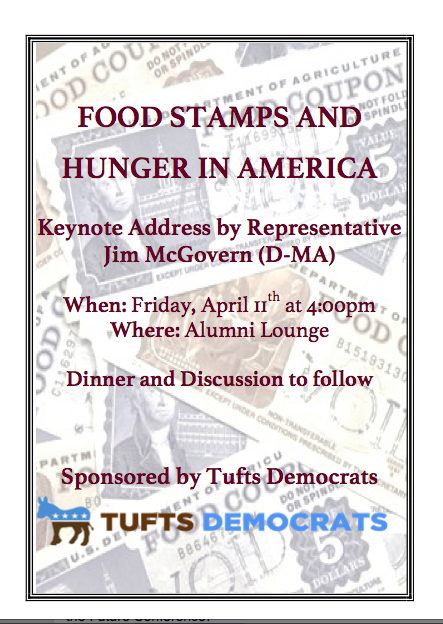 Rep. Jim McGovern (D-MA) will give the keynote speech Friday April 11, 4pm, at a Tufts University conference titled "Food Stamps and Hunger in America." The event is part of the annual "Issues of the Future" conference organized by Tufts Democrats. Rep. McGovern is a leading advocate in Congress on behalf of U.S. nutrition assistance programs, including the Supplemental Nutrition Assistance Program (SNAP). 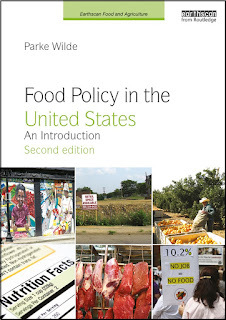 Chapter 10 in Food Policy in the United States addresses "Hunger and Food Insecurity," including links to many other readings and data resources. On this blog, related material can be found under the tags for SNAP and hunger. For example, a 2011 data visualization shows how SNAP participation ebbs and flows with the changing macroeconomy. At Civil Eats yesterday, Aliza Wasserman explains the dilemma for the public interest entrepreneurs who are developing a fair trade banana market. The article describes a recent conference at Tufts University. The most difficult question is whether fair trade bananas should come only from smallholders and cooperatives (preserving fair trade principles but limiting scale), or instead whether fair trade sourcing should allow larger plantations so long as they follow the stipulated principles (sacrificing a small-is-best principle but achieving a larger share of the total market). Fair Trade banana plantations have also been crucial to building a robust supply of Fair Trade bananas. Plantations represent both a key challenge and opportunity, by providing the promise to impact the broader industry and bring Fair Trade bananas to a larger consumer base. Nearly everyone at the conference hoped to impact the broader industry, whether they are focused on the future of small-scale or “smallholder” farmers, or the overall future of Fair Trade bananas. But many of the presenters felt that the current pricing system, in which the Fair Trade certifying bodies, like Fair Trade International or FLO, distribute the same premium to plantation owners and small landholders alike, represents a major flaw in the system. Many in the industry believe that cooperatives of small producers should receive a premium that is linked to their higher cost of production relative to plantations, which can take advantage of economies of scale. Yet, the first banana producer to receive Fair Trade certification was a plantation, and scaling up Fair Trade would not be possible without them. While a student at the Friedman School, Wasserman was a regular contributor to the U.S. Food Policy blog. What if Walmart paid employees enough to avoid food stamps? I enjoyed this video for sharp writing, clarity of data presentation, and measured tone. While still relying on economic markets for a thriving food economy, we nonetheless can expect our major grocery chains to do better on wages. No matter what one thinks of the proposed federal minimum wage increase, it is clear that the nation's leading employers should face binding social norms that constrain them to pay wages that reach a certain threshold. What should the threshold be? It is possible that some threshold would be too high, counter-productively putting grocery companies out of business. But, this video focuses on a much more humble and minimal threshold. At the very least, major grocery chains should pay wages sufficiently high to keep workers off the Supplemental Nutrition Assistance Program (SNAP) rolls. Nobody understands better than farmers that immigrants to the United States are real people and hard workers, not a caricature. When the leadership of the House of Representatives last year nearly failed to pass the farm programs, conservation programs, and nutrition programs in the farm bill, it showed that farmers had lost much political influence in the House. Similarly, as ferociously anti-immigrant views recently have blocked immigration reform in the House, farmers again feel the loss of their political influence. Not all Republicans are anti-immigrant, just those who pander to certain constituencies that use terrible anti-immigrant rhetoric to block reform in the House. In more ordinary times, many farmers have voted Republican, and they likely will do so again in the future. I follow the carefully non-partisan work of the AGree agricultural policy initiative on this issue. Leading fast food companies have pledged to follow specific advertising guidelines under the Children's Food and Beverage Advertising Initiative (CFBAI), a project of the Council of Better Business Bureaus (BBB). These voluntary pledges remain quite weak. One recent summary of the argument that these pledges are insufficient [note: slight edit for clarity Apr 5] comes from the Rudd Center for Food Policy and Obesity at Yale University. The companies describe the pledges in shorthand, saying loosely that they now advertise only healthy food to children. In truth, more precisely, the companies still advertise both unhealthy and healthy food choices to children. For example, a company pledge may claim to show only children's meals with comparatively healthy sides and beverages (such as apple slices and milk) and not less healthy options (such as french fries and sugary soda). Even with no further deception, the advertisements for the healthy meals help build brand awareness with children, increasing probability of generating a purchase occasion. Once the child and guardian are in the restaurant, the company heavily markets apple slices and french fries, milk and soda, whatever it takes to make the sale. The CFBAI guidelines address advertising on television and the web and do not prevent marketing of unhealthy options at the point of purchase, so the unhealthy options remain a large fraction of actual revenues for children's meals. And, in any case, there is further deception. New research supported by the Robert Wood Johnson Foundation finds that most children who view Burger King advertisements showing apple slices think the advertisement is showing french fries. The apple slices look like french fries, and the children overlook a small apple symbol on the package. I do not believe the confusion is accidental. Reason Magazine's Hit and Run blog credulously accepts an account in which the children's misunderstanding merely shows that Burger King is effectively marketing apples by presenting them in an "apple fries" format, but that sounds like spin to me. You can judge for yourself. Here is the actual video from the research team, led by James Sargent, MD, co-director Cancer Control Research Program at Norris Cotton Cancer Center. Ask yourself, is Burger King advertising only apples (as the company's CFBAI pledge claims), or is Burger King also in practice advertising french fries to children (in which case the company's CFBAI pledge is dishonest)? I'm enough of an economist that a fast food company's marketing fails to outrage me. I expect Burger King to market burgers and fries as vigorously as it can, subject to the dual limitations of government rules and social norms. What bothers me instead is that organizations that purport to be independent referees serving the public interest -- such as CFBAI -- pretend that the fast food companies really have voluntarily ended their advertising of unhealthy food to children. It is admirable to seek market-oriented business-friendly solutions to social problems, but let's not deceive ourselves by claiming that marketing unhealthy food to children is a problem we already have under control.